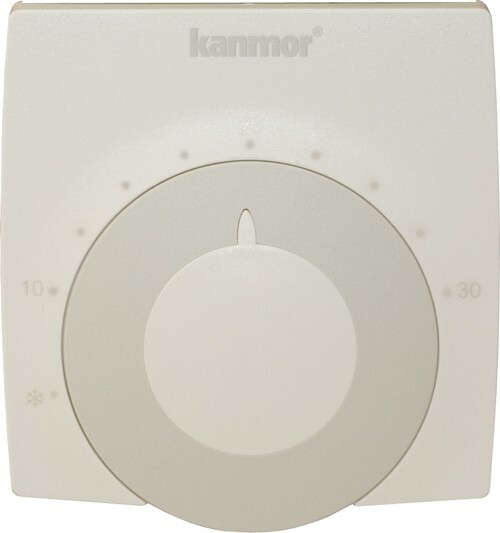 The KANMOR 501x Room Thermostat is a 24Vac electronic dial thermostat, with lock and limiting facility. Features night setback when used with remote time switch. Setback 4˚c fixed. The thermostat measures the temperature and compares it with the setting value. (The setting value is set by turning the dial). If the measured value is below the set value the thermostat demands heat. When the desired temperature has been reached, the thermostat terminates the heat demand to the wiring centre.